The definitive, deeply revelatory, and wildly dramatic story of the Alex Rodriguez and Biogenesis scandal, co-written by the reporter who broke the story. All Porter Fischer wanted was the $4,000 Tony Bosch owed him. But Bosch would not pay him back, so he swiped Bosch’s Biogenesis ledgers as collateral. Fischer eventually examined the lists of clients and treatment plans revealed in the ledgers and saw what he really had: proof that major and minor sports figures came to the Miami antiaging clinic for anabolic steroids, human growth hormones, and other illegal drugs. That included one of the greatest sluggers in modern baseball history, three-time MVP Alex Rodriguez. When Fischer showed those notebooks to Tim Elfrink, an investigative reporter at Miami New Times, it sparked one of the wildest—and costliest—sports scandals ever. In Blood Sport, Elfrink teams up with Gus Garcia-Roberts, an investigative reporter at New York’s Newsday, to finally tell the full story. A-Rod, an obscenely talented and wealthy, self-destructive man, is one of the book’s central figures. The tale is rooted in the unique tropical lawlessness of Miami, a city populated with muscle-bulging crooks, spray-tanned fake doctors, and millionaire athletes looking for any chemical advantage. And it’s a chronicle of America’s latest mad quest for a fountain of youth—a billion-dollar obsession with HGH, a drug with uncertain benefits and even hazier risks backed by a mountain of lobbyist dollars. 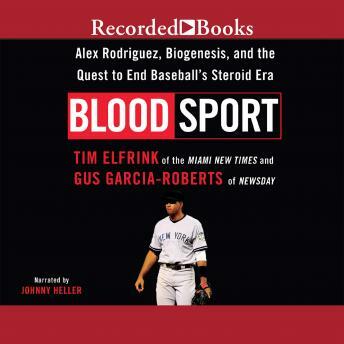 Seven years after Game of Shadows let readers experience the characters and drama inside baseball’s performance-enhancing-drug scourge, Blood Sport will demonstrate that the steroid era never ended. It evolved.